Woah! Has been long time since I attended a GUADEC, besides the one in Coruña, of course. And I am very excited about it! My plan is to chill with other GNOME developers and talk about the future of GNOME OS. 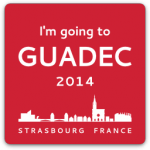 Author vjaquezPosted on July 24, 2014 July 24, 2014 Categories Planet IgaliaTags guadecLeave a comment on See you at GUADEC!